Professor McDonald cited her favorite Ozu film as Floating Weeds, and examined several stylistic aspects of the film that depicted the filmmaker’s thematic distillation and visual economy, specifically: (1) the pausive function of the isolated, blue lantern shot after Komajuro’s departure (a ‘nothingness’ that signifies a great weight), and (2) the recurring shot of Komajuro looking at Oyoshi’s compact flower garden that reflects his desire to establish ‘roots’ with his family. 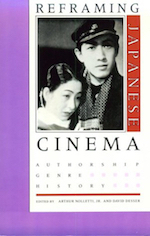 Professor Sato proposes that Ozu’s singular and idiosyncratic cinema resulted from the culturally indigenous ‘problem’ of visual confinement caused by character immobility when seated on tatami mats for which, he explains, Kenji Mizoguchi’s solution was to use fluid shots and opening shoji screens between rooms in order to create a sense of visual extension. Ozu’s solution – to use low camera angle – retains the correct perspective (and creates a flattering framing) of a seated human figure, an unavoidably recurring image in the presentation of a Japanese home environment that becomes distorted and awkward when shot from a high camera position. Citing the final family gathering scene in Tokyo Story, Sato further reinforces Ozu’s penchant for duplicated images (both characters and inanimate objects) and argues that his use of bar-styled seating does not reflect a deliberate attempt to show intrinsically Japanese settings (nor his fondness for sake bars) but rather, as an opportunity to create repeating patterns in the characters’ seating position. Lastly, Sato notes that Ozu’s depiction of avoided eye contact among his characters (except for dramatic moments) is a reflection of Japanese behavior. Professor Yoshimoto deconstructs Ozu’s postwar film, Late Spring – a film that has received some criticism for its elision of the austerity and depressed economic conditions of Japanese life under U.S. occupation in order to illustrate that Ozu repeatedly and effectively subverts and circumvents censorship in order to comment on contemporary life. One example cited is a conversation on the correct spelling of economist Friedrich List’s name that is otherwise homonymous to composer Franz Liszt’s surname that, as Yoshimoto proposes, alludes to the interrelation between culture and economy in postwar Japan. Yoshimoto further cites anomalous, visual cues that Ozu intersperses throughout the film in order to convey Allied presence in the country (through a poster for a gallery exhibition) as well as references to other members of the Axis nations (Germany and Italy) in order to illustrate that Ozu was, in fact, chronicling the condition of the times, albeit through inferential – but blatantly and explicitly – ‘coded’ images.